This isn't really a story. I just had my 22-year old brother Bradley pass away on Christmas night. 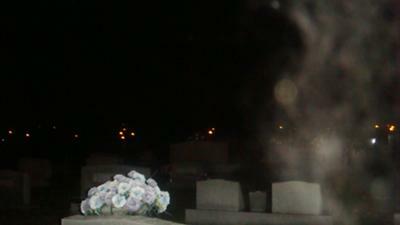 I was visiting his grave at 11:45 pm at night and I couldn't find it, so I just started taking pics hoping I could see it. Then I said, "Bradley baby, where are you? I can't find you." After saying that, I took a photo and two faces appeared in it. One is an old man on top (it's sideways with an open mouth) and the bottom is my brother's face (the crown of his forehead his nose in the middle and two eyes). Everyone sees it. Also there is a large orb in the middle. Upon taking the pic I stepped on my brother's grave and found it! I'm very sorry about your brother. I can't see the face. Where is it?? I can see it and yes i do think you have a real ghost caught on camera. So sorry about your bro! But you just gotta be happy! At least his soul is with you! He hasn't left y'all completely; he left only his body! I wonder, my grandpa died too, but he did something and went: Me and my cousins= mischievous=broke baby's toy camera. We tried and tried to fix it. We at last fixed it but the 'Tick' sound which came when we pressed the button didn't come. We went near my grandpa's chair and tried again. It worked! I wonder if the same will happen to you. Well, be happy 'cause you've probably been a good sis and probably he's been a good bro. Keep those memories in your heart and then he'll never leave you, ever. Not even when the string of life gets cut. Never. Then you'll be O.K.! We wish you a good future! P.S. He hasn't sinned much to die on Christmas night. Hey, since it's near Christmas now, go again to the cemetery and see if you can find more pics! If you do, please send them! P.S.S. The story was more touching than scary! P.S.S.S. Wonder who the old man was? I also see the faces in your picture!, I hope it brings you comfort knowing that he watches over you! Thanks for sharing your story and your photo! I truly believe we all NEVER die; just our physical bodies. Bradley's spirit will live on forever, one day you'll see him again. I am very sorry for your loss. Whatever that pic turns out to be, I hope your brother is at peace and your family, well.